NTP (Network Time Protocol), is used to synchronize computer system clocks via packed based TCP/IP-Networks. For more Information on NTP see Network Time Protocol or Meinberg: information on NTP. Clock elements on TFT displays: without a correct time server the clock elements will be empty and will not show any time. System time for system state and debugging: system time will start at January 1, 1970, 0:00am each time the system is booted. This time information is provided in any system state. This will make it hard to debug DHD systems. Clock logics: will fall back to system time and trigger at the system time starting at January 1, 1970. 0:00am after reboot. Temporary licences (demo licences): will be shown in system state but they will not work without a correct time server. You can configure the connection to a time server by using DHD Maintenance (MT5). Open Maintenance (MT5) on a computer, that is connected to the DHD network. Right-click on the DHD device, that you want to connect to the time server, the contextual menu opens. Click Network Config…. The Network Config window opens. In the Time area enter the IP address of the time server in the Primary Time Server box. Depending on your chosen time server you may need to enter some further settings. For that click Setup time zone and DST … to be able to enter a general time zone offset and if necessary the settings for the daylight saving time. Click Send in the Network Config window. If the NTP time server is working correctly, the DHD device will sync its system time to it. It can take a while (up to 15 minutes) until the DHD device syncs to the NTP time server. To speed things up you can perform a System Reboot of the device via Maintenance or MT5. With 52/XC2, 52/XD2, 52/XS2 cores you can define two additional time servers. If the primary time server is not available, the core will use Additional Time Server 1. If Additional Time Server 1 is not reachable, the core will use Additional Time Server 2. Although DHD audio is not responsible for your IT infrastructure, we have two suggestions to provide a time server for your DHD network. DHD audio is not responsible for providing a correct NTP time server. When in doubt always contact your IT department first. We recommend the Meinberg NTP software. You can download it at Meinbergglobal.com. It is easy to configure and has proved to run very stable. Follow the installation instructions provided by Meinerg and make sure to have the required ports opened in your firewall configuration. DHD network is the network where the DHD devices are connected. This network should be separated from a office network. See Network specifications for more information on network architecture recommended by DHD audio. The Windows PC has to be connected and synced to a time provider. The Windows service Windows Time must be running. It provides the NTP time for external devices. Make sure the UDP Port 123 is not blocked by a firewall. 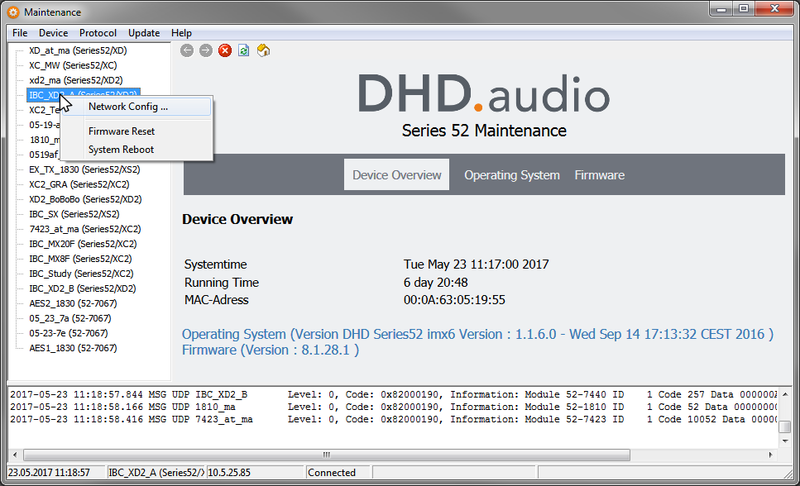 Now the DHD device can be configured. Follow the instructions in the section above Connect DHD device to time server. Network settings of the DHD device have to fit with the settings on the second Network adapter. 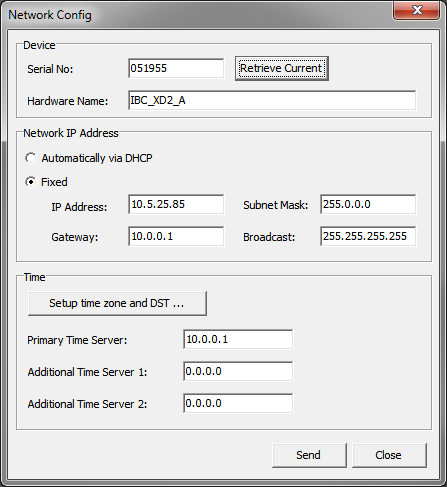 The IP address of the time server is the IP of the PC network adapter attached to the DHD network. This IP address needs to be entered at the DHD Maintenance Network Config page. Do not forget to reboot the DHD device. Is the w32tm (Windows Time) service already configured as server? - Check registry key: HKEY_LOCAL_MACHINE\SYSTEM\CurrentControlSet\services\W32Time\TimeProviders\NtpServer\, key enabled DWORD must be 1 (hex). On your computer, go to Start and open cmd application. Use the w32tm /stripchart /computer:localhost command. This compares the system time with another time server (/computer:) in the network.